Paul Manafort arrives for a hearing at District Court in Washington, D.C., on Friday. A judge ordered him to jail ahead of his trial in connection with alleged witness tampering. A federal judge ordered Donald Trump's former campaign chairman, Paul Manafort, to jail on Friday following allegations by prosecutors that he tampered with witnesses in his case. "You've abused the trust placed in you six months ago," said Judge Amy Berman Jackson. "I thought about this long and hard, Mr. Manafort. I have no appetite for this." But Berman Jackson said she could not turn a blind eye to the charges that Manafort had attempted to contact witnesses in his case after he was on bail. The judge said Manafort had not committed physical violence but rather had harmed the community. "The harm in this case is the harm to the administration of justice, the harm to the integrity of the justice system," Berman Jackson said. Manafort was led out of the courtroom by security officers; he was not handcuffed. As he approached the courtroom door, he waved to his wife, Kathleen, who nodded to him. Friends hugged Kathleen Manafort as her husband was taken out of court. Manafort, along with a Russian associate, is accused of asking future witnesses in the case to lie to the jury. Prosecutors say he and Konstantin Kilimnik contacted European witnesses to ask them to tell jurors in Manafort's trial that lobbying work they did together was confined only to Europe and did not take place inside the United States. Manafort is facing charges that include alleged money laundering, tax evasion, conspiracy and failure to register as a foreign agent. Manafort has pleaded not guilty in his D.C. case, and another federal case brought against him in the Eastern District of Virginia. In light of the witness tampering accusations, the special counsel's office earlier asked a federal judge to consider revoking Manafort's bail and ordering him into custody ahead of his trial this autumn. 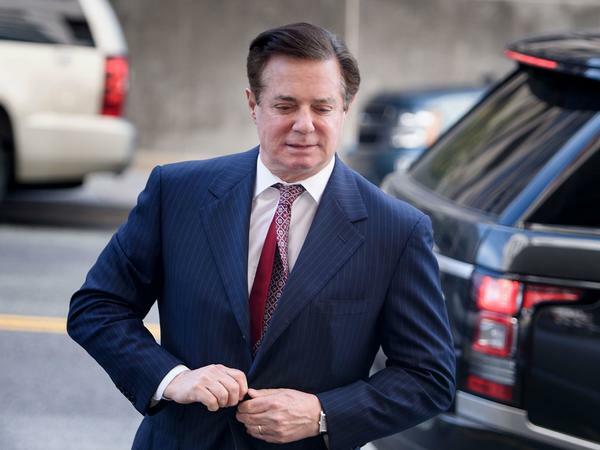 His lawyer, Richard Westling, had asked the judge to lay out a clear order listing people Manafort should avoid and to send him home under the bail conditions he had negotiated with the special counsel's office. Berman Jackson said she could not agree because there could be no guarantee that Manafort would not reach out to others. "This is not middle school," she said. "I can't take his cellphone." Manafort's lawyers also requested the judge let him go while they appeal, but she declined. Ordering Manafort into custody compounds the legal pressure he is facing and represents another step down from the position he once enjoyed as Trump's campaign boss and, before that, a longtime influence-broker. Manafort spent decades as a powerful insider; he told a congressional hearing in 1989 that "the technical term for what we do and what law firms, associations and professional groups do is lobbying," adding, "some people might term it influence peddling." Manafort was testifying about his role in a scandal at the Department of Housing and Urban Development during the Reagan administration. It wasn't the only time that Manafort's business practices have come under scrutiny. His lobbying firm — Black, Manafort, Stone and Kelly (the Stone was Roger Stone, who is also reportedly under investigation by the special counsel) — was included in a 1992 report by the Center for Public Integrity titled "The Torturers' Lobby." It cited the group's work on behalf of repressive governments in Nigeria and Kenya, the UNITA rebels in Angola, and a group with ties to Philippine dictator Ferdinand Marcos. Riva Levinson was hired by Manafort in the 1980s, becoming, she says, his "Third World traveler of choice." During her job interview in the summer of 1985, she promised Manafort "there was no place I wouldn't go. And Paul took full advantage, and there was no place he wouldn't send me." That included Somalia, where Manafort's firm was trying to sign a contract with dictator Siad Barre, accused of human rights abuses. Levinson recounted the episode in her book Choosing The Hero. "I asked Paul if he wanted this guy as our client," Levinson said. "Paul's response to me at the time is, 'Riva, we all know he's a bad guy; but he's our bad guy.' "
"You will see if you do any fact-checking that I was the person that negotiated the framework which is based upon which Ukraine is now a part of Europe. That was my role. That's what I did, and when it was completed, I left." Prosecutors say that Manafort's work for Ukraine also had a clandestine aspect; according to one indictment, Manafort recruited a number of European political figures to advocate on behalf of Yanukovych and Ukraine, apparently independently. Actually, their work was being coordinated by Manafort and underwritten by the Ukrainian government. Manafort's political skills in the United States were of more interest to Trump. He helped Gerald Ford secure the 1976 nomination and later worked for Ronald Reagan. He was hired by Scott Reed, then-presidential nominee Bob Dole's campaign manager, to help run the 1996 Republican National Convention. In an interview with NPR after Manafort signed on with Trump in 2016, Reed noted Manafort has an apartment at Trump Tower in New York. But more importantly, he and Trump were peers. "He's the one person in the room that calls him Donald," Reed said. "It's not 'Mr. Trump.' It's 'Donald.' 'Come on, Donald; we've got to do the right thing here.' And I think that's an important part of managing a campaign — to be able to have that type of relationship with the candidate of trust and, you know, knowledge." Trump had previously hired Manafort back in the '80s to lobby on gambling and real estate issues. Even though Levinson had her disagreements with Manafort, she called him a master strategist. "He can hover above all of the moving parts, and intuitively he understands how to put them together," she said. "And he taught me how to not get distracted from the clutter." Within the famously disorganized Trump campaign, not getting distracted by the clutter was an invaluable skill. But Manafort's tenure at Trump campaign was short-lived. He was ousted by Trump in mid-August, after a little more than two months on the job as chairman, when reports of his involvement with Yanukovych and the possibility that he received an illegal payment from Yanukovych's party drew intense media scrutiny. "My father just didn't want to have the distraction looming over the campaign," said Eric Trump, the then-candidate's son, in a Fox News interview. A dramatic moment at the federal courthouse here in Washington, D.C., today - a judge revoked bail for former Trump campaign chairman Paul Manafort and sent him to jail while he awaits trial. NPR national justice correspondent Carrie Johnson was there in the courtroom, and she is here now. Hey, Carrie. KELLY: So Paul Manafort in federal custody - why? What's the judge's reasoning here? JOHNSON: The judge found that Paul Manafort presented a danger to the community not because he might commit a violent crime but because of new charges that he tried to tamper with witnesses after he was already out on bail this year. Prosecutors say Manafort and an associate reached out to some PR executives allegedly to try to get them to stick to a story about whether they were lobbying in the U.S. or just in Europe. The special counsel found out about this, and government lawyer Greg Andres in court today called it a sustained campaign to obstruct justice. He said the government had no confidence that Manafort would follow the rules. And Judge Amy Berman Jackson ultimately agreed. You know, the judge said she really struggled with this issue. She even told Manafort, I have no appetite for this. But she said she couldn't turn a blind eye to these new allegations. And she considered less drastic measures but ultimately said to Paul Manafort, this is not middle school. I just can't take your cell phone away and make it all better. KELLY: And what was the scene like at the courtroom today? Was it crazy? JOHNSON: ...But with interns and tourists from out of the state who had come to see the - witness the events. They really got an eyeful. Manafort took notes, paid attention throughout the whole proceeding which took almost two hours. And once the judge made her ruling, he walked to the back of the courtroom with some court security officers. He went to the door, turned, looked back at his wife, waved at her. She nodded, and he went through the door. KELLY: Now, this is all newsworthy of course because of Paul Manafort's role in the Trump campaign, running the Trump campaign. What's President Trump had to say about this? JOHNSON: Well, the president tweeted about it today. He said the court ruling decision sending Manafort to jail was very unfair. And earlier in the day, he was asked about this matter by reporters. Here's what he had to say. PRESIDENT DONALD TRUMP: You know, Paul Manafort worked for me for a very short period of time. He worked for Ronald Reagan. He worked for Bob Dole. He worked for John McCain, or his firm did. He worked for many other Republicans. He worked for me - what? - for 49 days or something. JOHNSON: Well, we checked, and Manafort worked for Trump for almost five months, including a critical period through the Republican National Convention. KELLY: So a little longer than 49 days - all right, a couple quick questions. What's the next step Paul Manafort and his attorneys could take, and what do we know about where he is being held? JOHNSON: Yeah, Manafort's lawyer signaled he might try to appeal the ruling that revoked the bail. Meanwhile, the U.S. Marshals Service confirms that Manafort's in custody. They won't say where. I'm hearing he may be in the lockup in Alexandria, Va., which is suburban Washington, D.C. That's awfully close to where his trial is going to be in July. And other well-known people who have spent time there include former New York Times reporter Judy Miller, a bunch of spies, including Robert Hanssen and Aldrich Ames, and convicted terrorist Zacarias Moussaoui, among others. KELLY: And to the big question looming over all of this, which perhaps is unknowable - but do we know whether any of this might prompt Paul Manafort to change his mind and cooperate with the probe and with investigators? JOHNSON: Right now there's no way to tell. People close to Manafort have told me for a year he has nothing to help the special counsel and nothing that would hurt President Trump. Manafort's 69 years old, though. And if he's convicted, he's already in line to spend what could be the rest of his life in prison. The only way to avoid that short of a not guilty verdict is to cooperate with investigators and get a reduced prison sentence. KELLY: NPR's Carrie Johnson, thank you very much.